Lehn Painting is an expert in Dryfall painting. Dryfall is a type of paint that contains additives that cause the paint to dry very rapidly. As the paint falls, within 10 feet, it is already dry and can be swept up. Dryfall painting eliminates the risk of contaminating clean surfaces and getting any paint outside of the area that needs to be painted. Unlike spray paint, Dryfall painting can reduce the risk of ruining surfaces. Lehn Painting has years of experience in Dryfall painting structures, both interior and exterior and can work in any environment. Our teams of Dryfall Painting experts are fit to deliver excellent dry fall painting services no matter how large the structure. 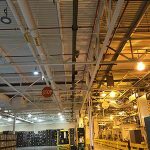 We have experience in dry fall painting commercial properties, structural steel interiors, factories, storage facilities and manufacturing plants. If you have a large structure that needs dry fall painting, give us a call. We can help you determine whether dry fall painting is the right approach for your project. If you are interested in discussing your Dryfall painting project with Lehn Painting, please give us a call or contact us through our online form. We’d be glad to inspect your environment to determine the best approach for your Dryfall painting needs. Lehn Painting has been servicing the Cincinnati, Ohio, Kentucky and Indiana regions for over 20 years.